Stunning and spacious 2-story in Vicksburg Commons! This 4 bdrm, 3 bthfeatures a staircase in the back of the home, finished wlkout LL, 2 fireplaces, main floor laundry, and a large fenced in yard. Formal living rm & formal dining rm w/arched entryways. Family room w/ frplc. Gorgeous kitchen w/ white 42" cabinets, solid surface countertops, tile backsplash, SS steel appliances, hrdwd flrs, and desk area all remodeled in 2010. Beautiful all seasons room w/ vaulted ceiling, tile flooring, and surrounded by windows. Master suite w/ sitting rm, large walk-in closet, & a luxury bath w/ soaking tub, double bowl vanity, & separate shower. Finished walkout LL w/ frplc, family room, rec area, plumbed for future bath, and plenty of storage space. Zoned HVAC. Neutral colors. 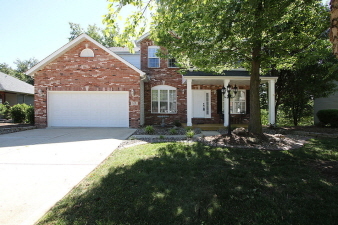 Beautiful brick patio w/ water feature w/ waterfall, mature trees for privacy, and plenty of yard. Located close to the YMCA, schools, shopping, dining, and interstate access.